A lighting and ceiling fan retailer who works with Marketing 360® wanted to rank higher in organic rankings for their ceiling fan products. A monster page did the trick. You sell a particular product. You want customers to find you if they go on Google and search for that product. Simple enough. Or not. Sometimes the basic content of a website isn’t enough to get Google’s content-hungry algorithm to take notice. 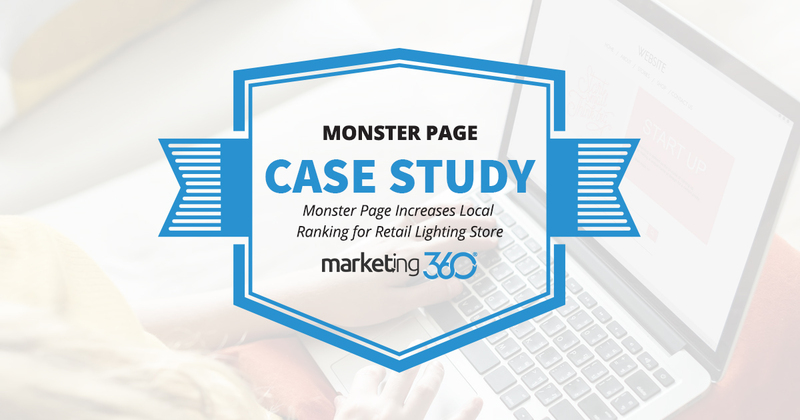 This is why we create monster pages, which is our name for an SEO landing page. These are content rich pages filled with text, images, and videos designed to be engaging and eye-catching. But just as importantly, they rank better in organic results. So, we implemented this tactic for a ceiling fan showroom in Sarasota, FL (click through to see the page). This resulted in something fairly rare in the SEO world: a rapid rise in rankings. You can see high ranking for many variations of this keyword. Note that Google treats these as local results, so this traffic is representative of searches in the Sarasota area. When it comes to consuming content, Google is a monster. Our SEO landing pages give that monster just what it wants.